Last months, we're seeing more and more placeholder apps created by people who are following a certain Android tutorial. I'm not going to give examples because it's really hard not seeing them. I feel we can't really blame the users doing this; "they're just following the instructions" and even if there are/were rules forbidding this, most of them are not really active on Stack Exchange so they're not aware of them. And one of these users might one day really be able to create a useful Stack App. As @BrockAdams noted, most of these are downvoted and get roomba'd after 30 days. status-completed Contact the site, asking to rewrite their tutorial so that users make proper placeholder posts and delete them when they're done. status-completed Add a new close reason, e.g. "Placeholder apps must show some kind of intention to follow-up with real functionality". If they get closed, Roomba already activates within 9 days, even when the score is 0 and when there is a (non-positive scoring) answer. Have a script running that closes/deletes placeholder questions after x days of inactivity. 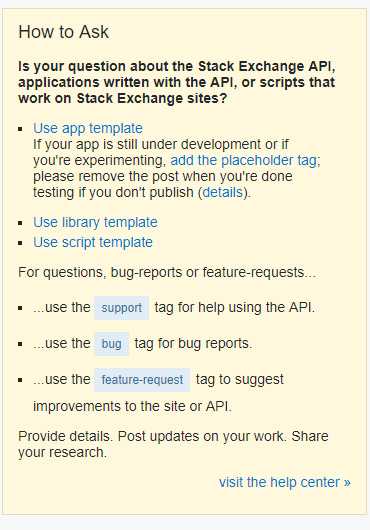 Have a special API key for tutorial apps, so that users don't need to post a question. Have a ♦ moderator delete these questions more aggressively. Credits to @BrockAdams for some of the suggestions. This is a placeholder question for an app that's still under development; it will be deleted within 9 days unless regularly edited to show progress on development. If the app is ready for others to use, follow the template and flag for moderator attention to indicate that this post can be reopened. I went ahead and added this; go ahead and use it if you like. Additionally, I sent a message to the folks at vogella asking them to add a tiny bit of guidance to the tutorial. Not the answer you're looking for? Browse other questions tagged discussion placeholder meta . Are apps created from the CC data dump ok to add?